Love to read AND stitch? 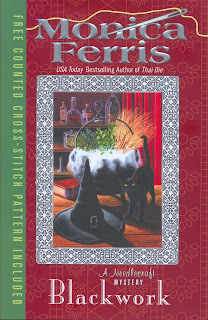 Monica Ferris has the perfect page-turner to stroke those passions: "Blackwork" is the latest book from this popular fiction writer whose colorful story lines always feature needleworking super sleuths following mystery threads around stitchery shops. We have been delighted to be characters in previous books, and this one features a design using Kreinik threads—included a new Kreinik Fine #8 Braid color, Fly By Night. We sat down with Monica to hear about the latest book and her next project. KREINIK: Where did you get the idea of the "Blackwork" story? MONICA: This one started with the title. Blackwork is a very attractive kind of needlework. It took me a little while to think how best to use the title as a mystery theme, however. But I have two friends who practice Wicca, so I had two sources for the practices of that religion. I know there are people who think only of the "dark side" of Wicca -- that it practices cursing and other black arts, but neither of my Wiccan friends would dream of doing something so dreadful (and dangerous, they say). So there was my conflict, and the story grew out of that. KREINIK: Your books are grounded in the needlework community and are very popular. How did you get involved with needlework? Where does your interest in needlework come from? MONICA: Oddly enough, I was asked to write a series with needlework as a theme. My then-editor at Berkley was herself a counted cross-stitcher and saw how well a quilting series was doing, so she looked around for someone willing to write a needlework series. I had just ended my work on a medieval mystery series, so she contacted my agent who contacted me. I was so flattered at being asked -- instead of the usual process of coming up with an idea, writing the novel, and then getting my agent to try to find a publisher -- that I accepted at once. I was very much a novice at needlework, and so that's why my amateur sleuth starts out so ignorant. As I learn things, so does she. And now I find that I enjoy exploring the many, many sides of needlework. 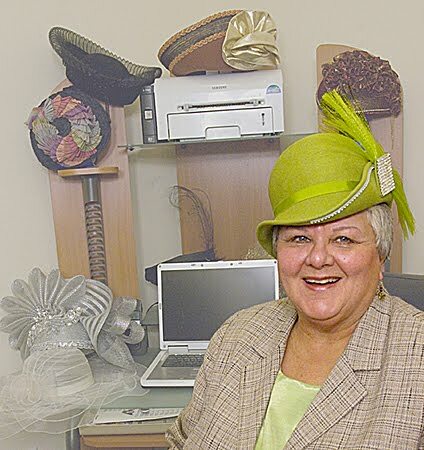 KREINIK: Writers and needleworkers both create, putting together something out of scraps, bringing the fabric or page to life, with “threads” running through the "story". What is your favorite part about writing a book? MONICA: That's a very difficult question. When things are working, it's all a joy: Getting the idea, setting up the plot, watching the story come to life as I write it, finishing it (whew! ), editing it, getting a sample of the cover art (that's when it becomes real), holding the copy of the actual book in my hands. Every one of those steps is a pleasure! The only part that isn't fun is getting a writer's block, and I can generally work around that. KREINIK: What is the hardest part about writing a book? MONICA: The middle. The opening scenes are intriguing and the grand finale is exciting, but there's that long, complicated middle part, where I'm trying to get all the scenes to work together, sneak in the clues, advance the characters realistically, and move the story briskly along. It's fun, usually, but it's real work. KREINIK: Technology has affected both the needlework industry and the book industry. With the advent of electronic readers, do you think that printed books will become obsolete? Will your books be available for Kindles or other e-book readers? MONICA: Some of my books are already available in an electronic format. I don't think paper books will entirely disappear -- they are, unlike electronic devices, not made unreadable when the science advances to a new generation of device -- but I think publishing is riding a new and powerful wave into the future. I don't think anyone really knows what strange and new shore they will end up on. KREINIK: Can you give us a hint for what's in store for the next book, and when it may be released? MONICA: The next book, due out in December, is Buttons and Bones. Jill and Lars Larson buy an old log cabin up in a northern part of the state, and while renovating it, find a hidden trap door leading to a root cellar. On the dirt floor of it lies a human skeleton that appears to belong to a World War II-era German soldier. Meanwhile I am at work on Threadbare, about the murder of two homeless women. WANT MORE MONICA FERRIS? She shares a blog with five other "crafty" mystery authors -- http://killerhobbies.blogspot.com/. Her day to write an entry is every Wednesday. Check out Monica's web site at http://monica-ferris.com/ for info on all of her books plus her schedule of book signings. It began as an email to Kreinik from model plane builder Rob Stewart. He wrote, "I just bought four rolls of your metallic threads "cord" size. I build scale plastic models of WW1 era aircraft and I thought the threads would be perfect for some detailing in engine wires, cockpit parts, and rigging wires, etc. In order to recommend these to fellow WW1 model enthusiasts, I would like to know roughly what diameter these threads come in..."
When we emailed the information to Rob, it started a wonderful conversation about model aircraft, the tiny threads you need to accurately replicate details, and a needlework connection. "There is quite a large community of modellers, building in different scales, and different thread sizes would have different applications for many people," Rob told us. Colors like 011C Nickel, 021C Copper, and 001C Silver in Kreinik Cord realistically replicate certain wires and cables. So we found out metallic threads are perfect for replicating aileron and rudder cables, plug wires and rigging, among other various parts. Since we didn't know a lot about model airplane making, but were extremely impressed at the detailed work and use of our threads, Rob volunteered to make us a model. 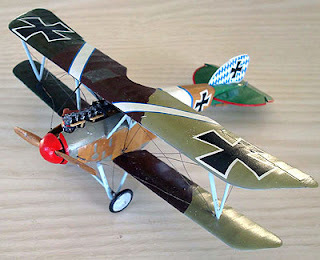 We contacted Jeff at Rare-Plane Detective who had an EDUARD 8036 Albatros D.III Weekend Edition model plane kit. Rob built the model for us and we are excited to share photos here. See if you can spot the Kreinik threads — threads so familiar in stitching techniques are marvelous micro-threads to model makers. And the needlework connection? Turns out Rob's mother-in-law works in a needlepoint shop and we got to meet her at a TNNA trade show. Looks like threads are woven into the tapestry of this creative family. Our very own Doug Kreinik was a guest on Gone Stitching's Blog Talk Radio. His interview aired on August 9, 2010. This marks Doug's second appearance on the show and will be a lively and fun show about needlepoint and embroidery. Don't worry if you missed it. Its available on demand. Click here to listen to the 8/9/10 interview. Gone Stitching is a needlepoint store located in Bergenfield, NJ. They are a full service shop that sells threads, canvases and offers classes, stitch guides, finishing & framing services and much, much more. Did we mention they are one of the stores in our Kreinik Mall? Click here to visit their Kreinik Mall home page. When I go to friends homes for dinner I am often asked to bring my salad bowl and fixings. Here is my favorite. Mix until you have a very smooth consistency. Break into small pieces bite size pieces. Place in a very very large bowl. This makes it easier to mix and toss. Remove all seeds. This prevents salad from becoming too watery. Mix all vegetables well. 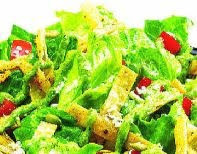 Pour dressing over salad and mix well. I prefer mine made from French bread covered with a olive oil and garlic sauce. Sauce is made from 2 cloves minced garlic and 1/2 a cup of olive oil with a dash of oregano and basil. Spread this on with a pastry brush and cut into little cubes. I brown this in the oven for 10 minutes until crisp at 400 F.
Grind freshly ground pepper over salad. I always put the freshly grated parmesan cheese in a bowl on the side. Some people like a lot and some people ,like me, are lactose intolerant.. I never use an egg in my sauce. Again some people do not like the thought of the raw egg and I personally do not like to take chances with salmonella..
Place salad on chilled plates and dig in.